Our beard conditioner will fortify, soften and tame your beard. The oils are fast absorbing, and a little oil goes a long way! The ingredients are all natural and vegetable based. – Grape Seed – acts as a natural sunscreen and helps prevent dandruff. – The Earl is inspired by uplifting scent of Bergamot which is also known to protect and give shine to hair. 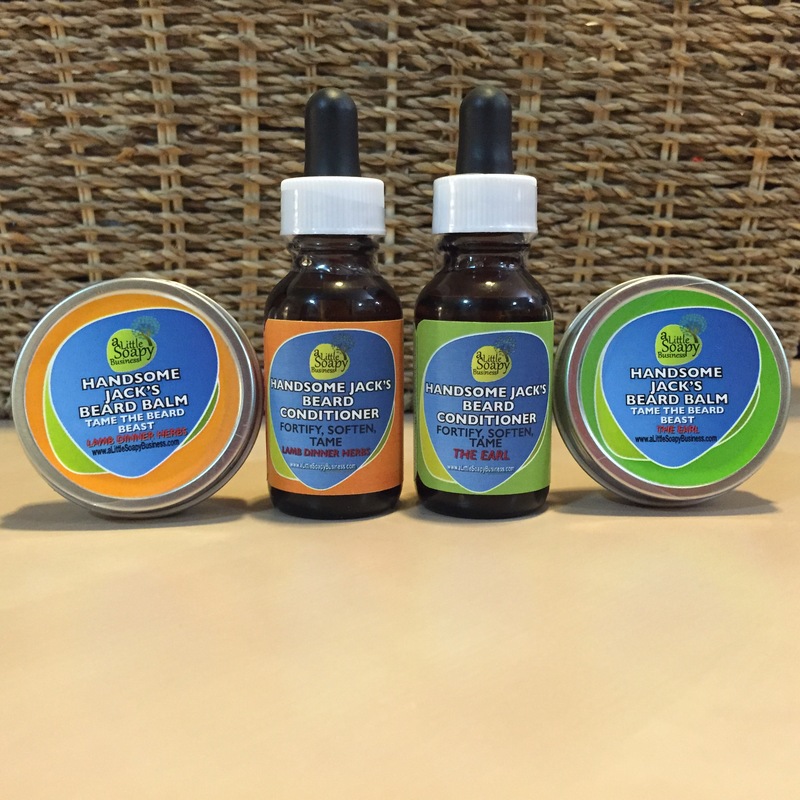 We also add Lemongrass and Cedarwood to calm beard itchiness and skin inflammation. – Lamb Dinner Herbs is inspired by refreshing Rosemary oil known to promote healthy hair and skin. Peppermint oil is used to calm beard itchiness. Directions: apply a few drops as needed depending on length of hair, massage into beard and skin underneath. Comb and style. For longer and unruly beards, follow with our beard balm to tame and style hair. Works best applied after the shower. Each bottle comes with a glass dropped in a brown 25ml glass bottle. Our Handsome Jack’s Beard Balm will fortify, soften and tame your beard beast. Apply this to unruly beard hair to tame, style and add a healthy shine. The base oils are fast absorbing, we add organic beeswax as it contains vitamin A. The Shea butter has Vitamin A, E and F. The ingredients are all natural and vegetable based. This product contains beeswax and is not vegan. Directions: take a small amount, soften in hands and apply to beard as needed depending on length hair and comb and style. Use our beard conditioner before using the beard balm for best results. Works best applied after the shower. Our beard balm is packaged in a 1 oz metal, recyclable tin. Order directly from me at info@alittlesoapybusiness.com or go to my Etsy Page.